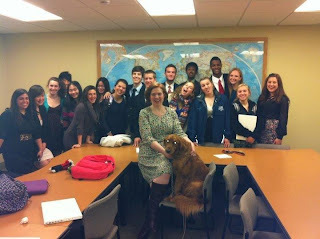 Expecto A Poem: Upper School of Witchcraft and Poetry: "It's not about the destination, but the journey." "It's not about the destination, but the journey." ...but it's been an amazing experience. Poetry is one of those subjects you generally wouldn't study without a particular interest in the subject. "Yeah, poetry's pretty cool I guess," some will say, while others scoff "Pfff, who actually reads poems anymore?" Even my experience with poetry was limited to Shel Silverstein and a brief poetry unit in sophomore English class. While poetry does appear to be a more obscure facet of English literature, it's by no means outdated or old-fashioned. It's just the opposite, in fact; the blog project completed for this class indicates nothing less. The freedom given to us on this project has allowed us to explore so many different aspects of poetry, everything from Harry Potter to the Black Arts Movement to Lady Gaga. Things that I wouldn't even think to categorize as poetry have been analyzed and critiqued for their poetic devices and impact on the world. The project has shown me just how much reach the poetic word has, and how we are affected without even realizing it. Thank you, Mrs. Lewis. It's been a fantastic class, one that always lifted my mood and brightened up my day, no matter what the situation. Thank you, other students in the class, for bonding together in the three months we spent together and bringing us closer. Thank you, Walt Whitman, for starting the American poetic movement and inadvertently giving birth to what would later be the best class ever.